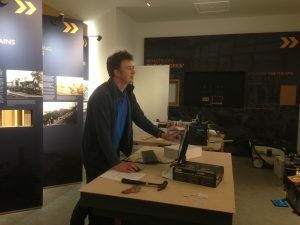 This month CMC have been onsite installing digital hardware for the Railway Preservation Society of Ireland, at their new visitor centre in Whitehead near Belfast. This includes iPad interactives, 55″ screens displaying movies and a large interactive touchscreen table. The new hardware is spread throughout the interpretation areas, and also in the carriage and locomotive sheds. All the digital content is online and updatable from remote locations.